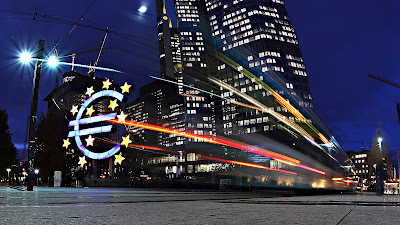 As widely expected, the ECB left its key rates and asset purchase plan intact. It reiterated its forward guidance that rates will remain at present levels or lower. Draghi was more confident about the economy, suggesting that the downside risks had further diminished. They are more closely to balanced, which sets up the potential for additional adjustment at the next meeting. Some members apparently saw the risks balanced. In the past, the ECB characterized growth as uneven and fragile. Now he says it is solid and broad. However, Draghi was still disappointed by the lack of structural reform. The main downside risks emanate from the global situation, which is a new condition. On prices, Draghi was less sanguine. The ECB, he says, needs to look through short-run developments and recognize that there is still no convincing sign of a sustained upward trend in prices. Headline inflation may hover near current levels through the end of the year, Draghi said. Draghi suggested there was more agreement about inflation than growth risks. He identified wage growth and tentative signs of pipeline price pressures from low levels, but the outlook, especially wages, is uncertain. A Bloomberg survey found a majority expect a shift in rate guidance in at the June 8 meeting and changes in the asset purchases to be announced at the September 7 meeting. Tapering is expected in Q1 18 and the first deposit hike, from the minus 40 bp in Q3 18. Draghi declined to comment about the sequencing of rates and asset purchases. Asset purchases will continue until at least the end of the year. The forward guidance applies to the full easing package and not just the asset purchases. The euro initially traded higher but held below yesterday's highs. However, the upticks were reversed, and the euro returned to session lows near $1.0880. Despite the minor range extension to the upside, an inside day is being recorded. A break of $1.0850-$1.0950 is needed to be of any technical significance.